Japan's eclectic taste (at least by my subdued, antisocial New England standards) has spawned this robot baby art project thing in the streets of Roppongi. When I pictured the Apocalypse, it looked, I dunno, different. 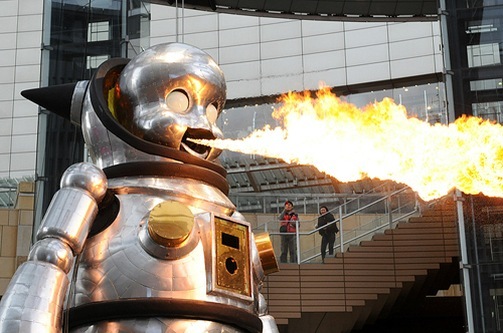 Called Giant Torayan, this seven meter tall fire-breathing baby monstrosity is the work of artist Kenji Yanobe, who was obviously abused by a baby or a bad man dressed in an Astro Boy costume at some point in his life. Giant Torayan will join a host of of other robots and sculptures around the neighbourhood as part of an art night that will see the place turned into a "robot-themed wonderland."